1. "Out of Town": What spoils Sal's first on-screen make out sesh with a man? 2. "Out of Town": Finish Don's line: "There will be fat years. There will be lean years. But _____." 3. "Love Among the Ruins": Patio Cola wants an advertising campaign with a similar look to what movie? 4. "Love Among the Ruins": Peggy has a little sexual fun with a Brooklyn College student before abruptly stopping. Why? 5. "My Old Kentucky Home": Finish the line: "I'm _____, and I want to smoke some marijuana." 6. "My Old Kentucky Home": Betty's father goes bonkers after discovering he may have lost, misplaced or had _____ stolen from him. 7. "The Arrangements": Betty's dad dies. Who visibly takes the news the hardest? 8. "The Arrangements": Kitty's cheerful mood in bed noticeably fades when her husband, Sal, does what? 9. "The Fog": Based on data, Pete suspects that Admiral televisions are popular with _____. 10. "The Fog": After a series of dream sequences that have you expecting something to go wrong with Betty's pregnancy, the birth goes off without a hitch. What's the baby's name? 11. "Guy Walks Into An Advertising Agency": Lois makes the mistake of running over Guy's foot with a John Deere. Who brought the lawnmower into the office in the first place? 12. "Guy Walks Into An Advertising Agency": Betty gives Sally _____. She explains that it's a gift from baby Gene. 13. "Seven Twenty Three": At the beginning of the episode, Don wakes up groggily with his nose caked with blood. What happened? 14. "Seven Twenty Three": Don is hesitant to sign a new _____-year contract with Sterling Cooper. 15. "Souvenir": Who runs into Joan at the Bonwit Teller department store? 16. "Souvenir": On Connie's dollar, Don and Betty travel to _____. 17. "Wee Small Hours": Finish Betty's line: "I hate to say this, but it’s really made me wonder about Civil Rights. Maybe it's _____." 18. "Wee Small Hours": Connie gets upset with Don's ad campaign because he failed to include what? 19. "The Color Blue": Neither Roger nor Cooper is looking forward to Sterling Cooper's anniversary party. How many years is the company celebrating? 20. "The Color Blue": Finish Paul's line to Peggy (recalling a Chinese proverb): "The faintest ink is better than _____." 21. "The Gypsy and the Hobo": Whoa! Joan hits Greg in the head with a _____. 22. "The Gypsy and the Hobo": Caldecott Farms' dog food is struggling because consumers have learned its product contains _____. 23. "The Grown-Ups": Duck keeps the news of JFK's assassination away from Peggy when she meets with him in his hotel room. How does he do this? 24. "Shut the Door. Have a Seat": For now, where does Sterling Cooper Draper Pryce operate out of? 25. "Shut the Door. 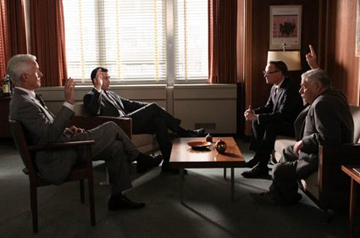 Have a Seat": Of the following, who isn't a part of Sterling Cooper Draper Pryce?